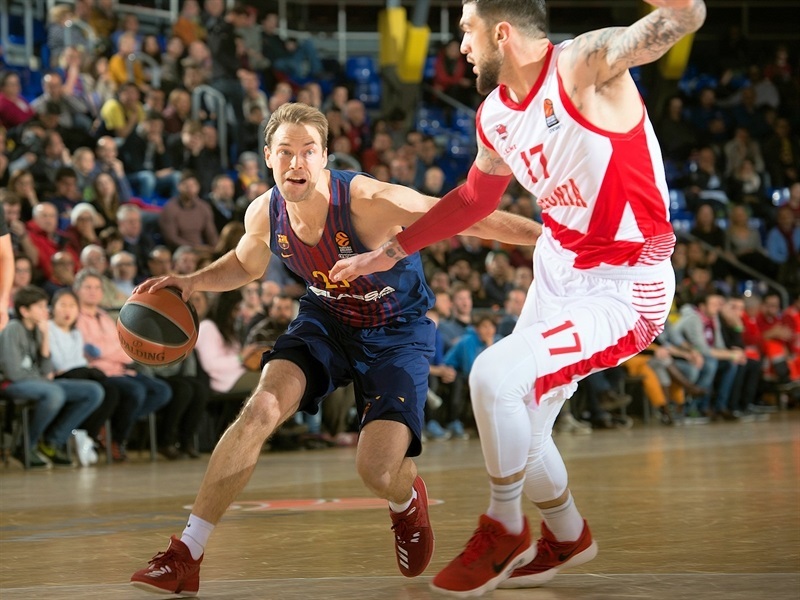 Baskonia Vitoria Gasteiz further strengthened its position in the playoffs places with a 73-86 road victory over FC Barcelona Lassa courtesy of a dominant final period. 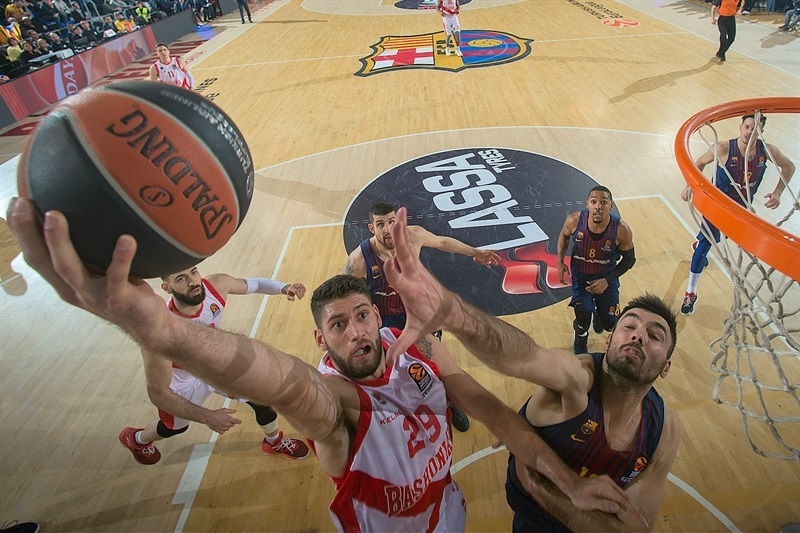 The game was close for the first three quarters but Baskonia stepped up its intensity in the last ten minutes, producing a 0-14 run to put the result beyond doubt. Baskonia took advantage of the absence of Ante Tomic through sickness to dominate inside, winning the rebounding battle 24-41. 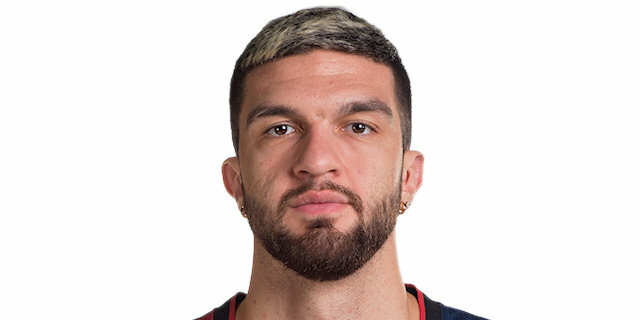 Vincent Poirier shone with 15 points, 8 rebounds and 5 assists, while Johannes Voigtmann provided 17 points and 7 boards. Janis Timma had a strong all-round game with 10 points, 5 rebounds, 4 assists and 4 steals, and Toko Shengelia had 12 points, 4 rebounds and 3 assists. 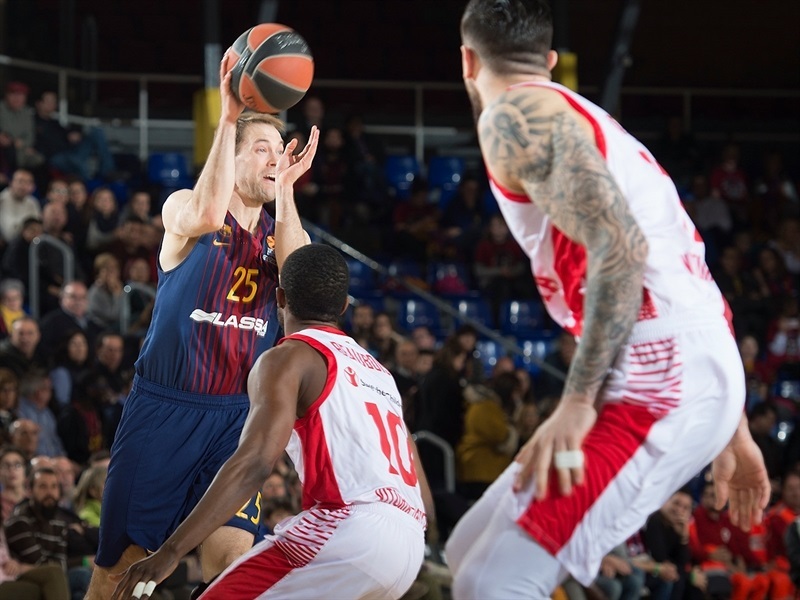 Petteri Koponen led Barcelona’s challenge with 21 points on 5-of-5 three-point shooting, and Pierre Oriola scored 15 points in defeat. 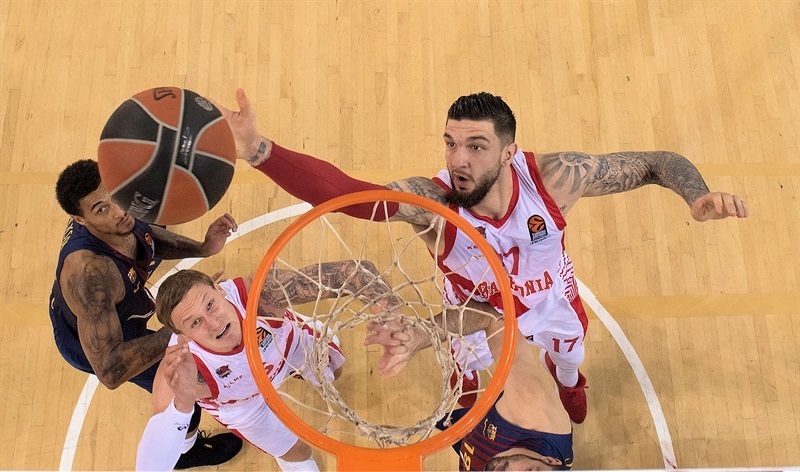 The victory sends Baskonia to 15-13, two games ahead of Maccabi in the battle for the final playoffs place, and needing just one win from its remaining two games to ensure progression. Barcelona drops to 9-19. Baskonia took charge early through strong play at both ends from Poirier and Voigtmann, who scored 7 as the visitors went ahead 2-7. 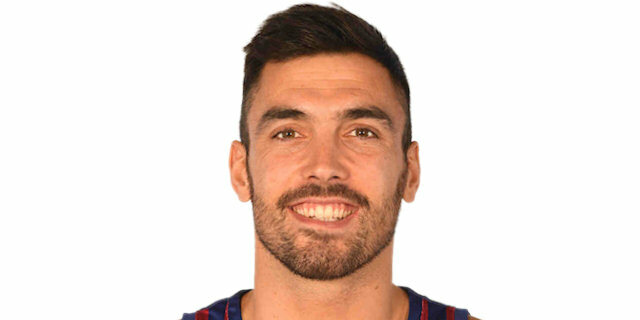 Barcelona restored parity through 5 points in a row from Phil Pressey, and a low-scoring opening quarter then progressed mainly through free throws before finishing 16-16. The pace picked up in the second period, with Baskonia moving 7 ahead as Timma followed a triple with a fastbreak lay-up. 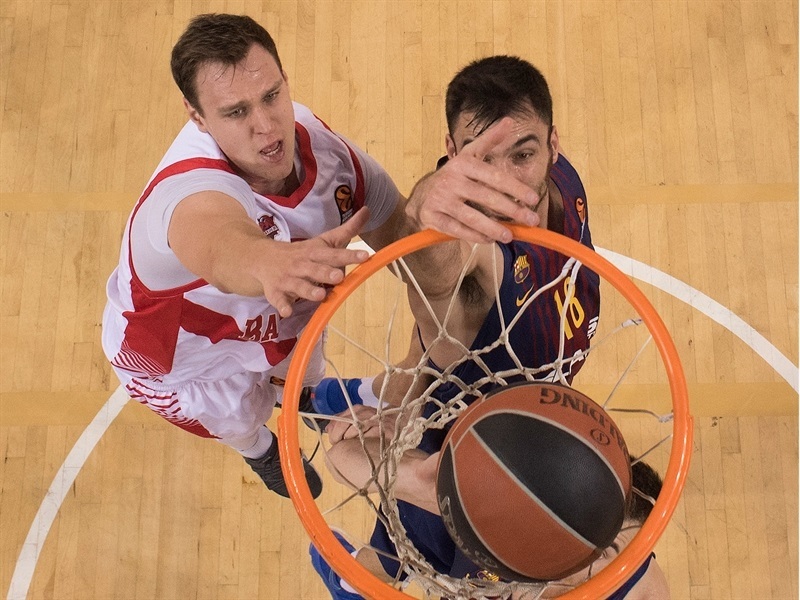 Barcelona came back as Koponen heated up with his first triple, and a driving lay-up from Thomas Heurtel levelled the score at 25-25. 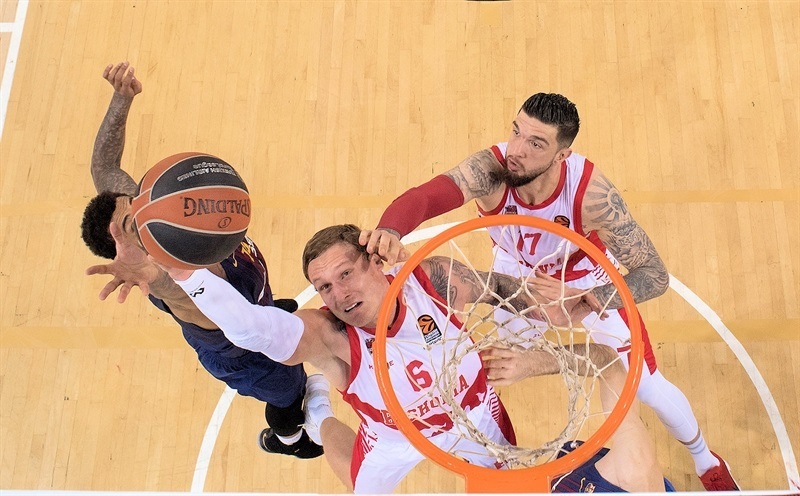 Baskets were traded evenly before Baskonia established an advantage through triples from Voigtmann and Luca Vildoza, but Koponen beat the half-time buzzer with a long-range two-pointer to make it 40-43 at the break. Another three from Koponen levelled the score early in the third, and Barcelona took its first lead as Oriola scored 5 in a row. 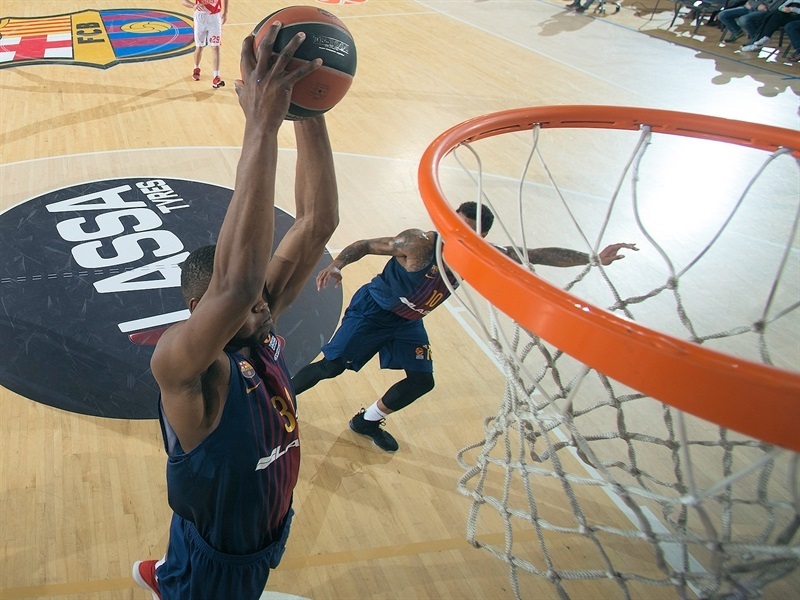 But Baskonia came back to lead through a two-pointer and free throws from Patricio Garino, and close-range finishes from Shengelia and Rodrigue Beaubois made it 50-55. Adrien Moerman’s triple got the home team closer, and after a series of free throws the third quarter ended 58-63. That was the signal for Baskonia to completely take over, launching a 0-14 run at the start of the fourth containing 5 points in a row for Poirier, a triple for Timma and a pair of close-range finishes for Shengelia. 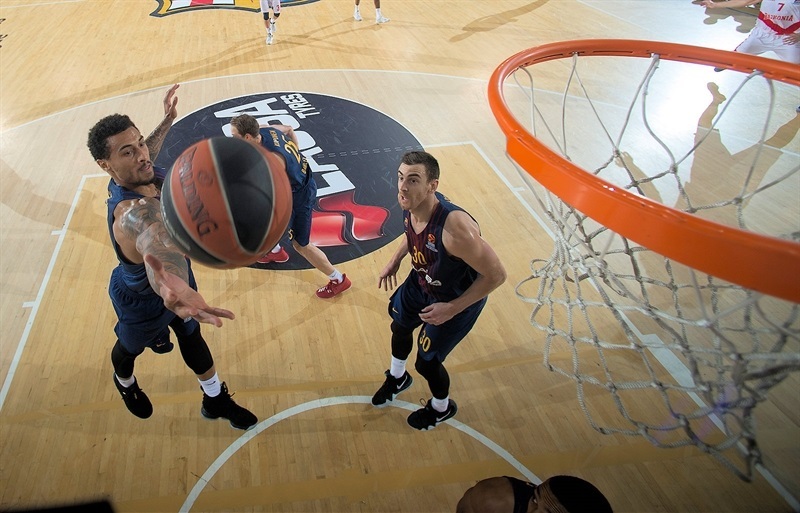 Barcelona tried to respond with baskets from Oriola and Pau Ribas, but Shengelia with a lay-up and Voigtmann’s third triple put the result beyond doubt and the final few minutes were irrelevant to the outcome. "Nobody is happy when you lose, but I am not disappointed with the way we played, especially in the opening 30 minutes. I believe that our players gave their best. They cannot do better. Of course, we were undersized in this game. That is a short analysis of the game . Anyone who knows a little bit of basketball can see that Baskonia's big men dominated, not just with rebounds, but also with points. Timma, Poirier, Shengelia and Voigtmann combined for 54 points. We fought and I think we played very good defense, but like I said, I cannot say anything negative about my players' attitude. Stats are not always important but we have better shooting percentages in two-pointers, three-pointers and free throws. We only lacked physicality under the rims, where we didn't have enough height to take some defensive rebounds and the game would not have been decided the way it was. 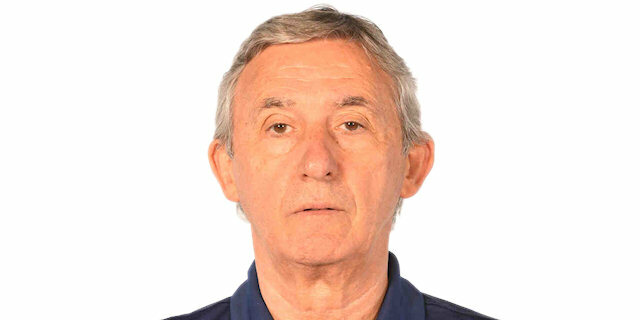 Congratulations to Baskonia for a good game. We cannot say anything wrong about a team that plays good, physical basketball, and made the most of its advantages tonight." "It was a very balanced game. We were able to play with good rhythm at some point in the second half, sharing the ball very well, playing agressive defense, getting steals and running the floor. That was the key moment. We improved our defense in the second half, especially in one-on-one situations. We rebounded well and finished the game with 22 assists, a very good number. There were actions in which we shared the ball very well and that is great to see how we play when we do that, but there are others in which we have to improve, overdribbling and not looking at the passing lanes. This is when we struggled, but when we pass the ball well, our chances to finish plays with good shots is higher, whether we hit them or not. I think that the team is confident now and our results are very good lately. That allows us to have more confidence. We have to calm down and know that if we want to play at a good level, we have to start with great defense, aggressiveness and passing the ball well, playing with patience, which are things we still can improve. We are in two strong competitions – we have to be happy after our wins, but knowing we are a demanding, competitive team, we always have to focus on the next game. We have to keep following our road." "We played well for 30 minutes but were not able to stop their offensive rebounds in the fourth quarter and that hurt us a lot. Ante Tomic did not play and we missed him; he is tall and intimidates. We did what we could but they are a tall, physical team. No excuses – we tried to do our best and now, we have to think about our next game. We did well for 30 minutes, being active in the game, despite not having some important players. In the last 10 minutes, we didn't have the intensity that we had before and which allowed us to get the lead. 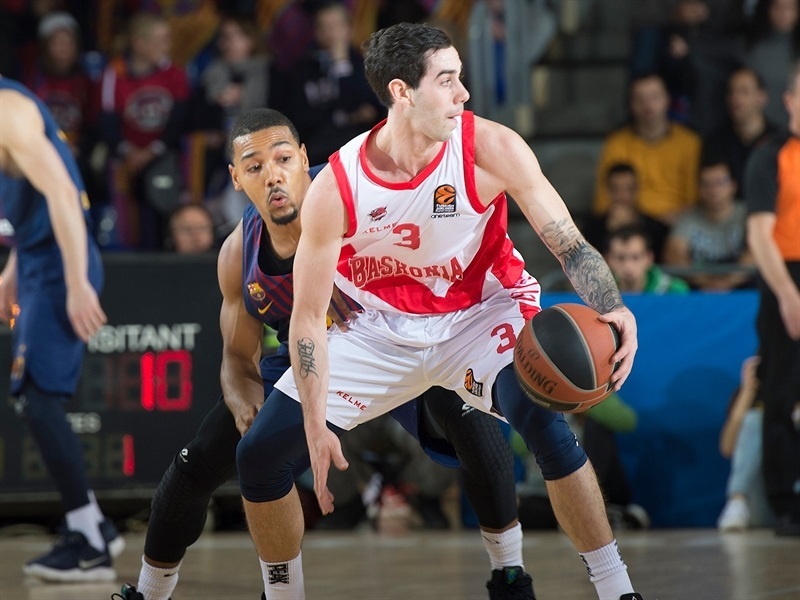 Baskonia capitalized on our mistakes, with great shooters and great big men who make the most of the situation." 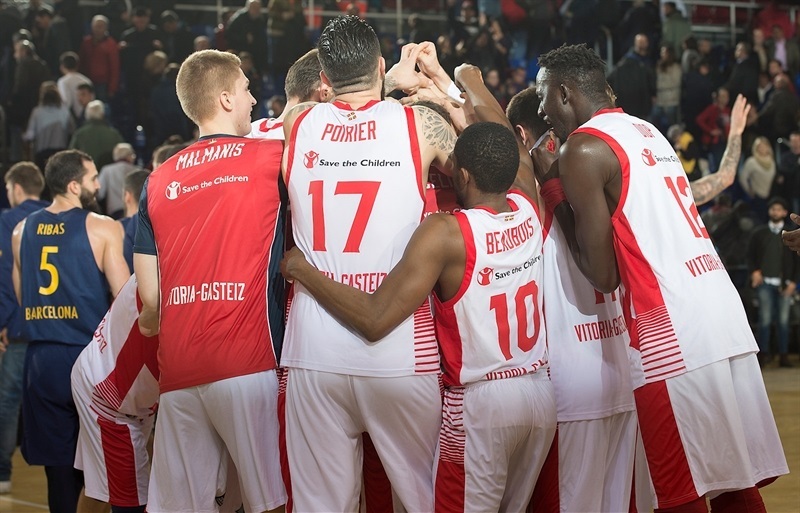 "It was a really important game for us before we host Maccabi. We needed this victory in our road to the playoffs, and I think we did a great job. 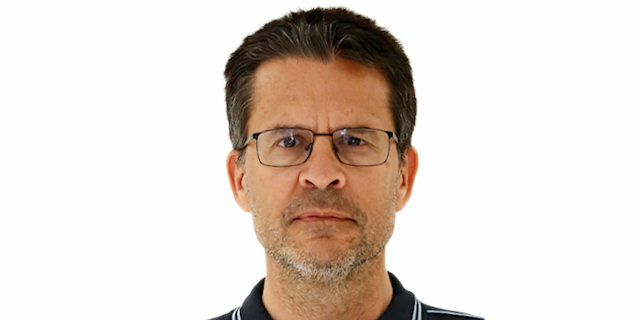 Ante Tomic didn't play for them, it was easier. I tried to use my body in the paint, like Jo (Johannes Vogitmann) and Toko (Shengelia). We did a good job."